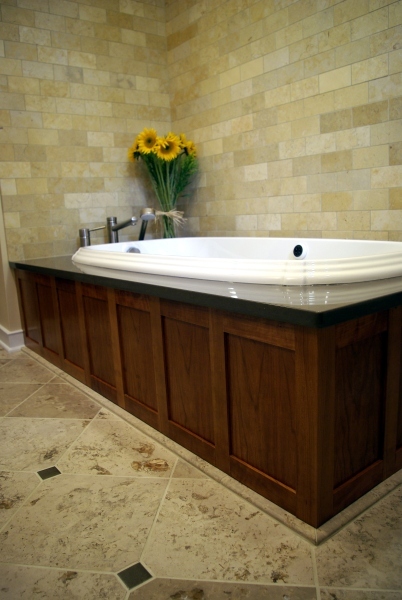 Granite, marble, limestone and soapstone are the most common choices in this category. Granite is an igneous rock (formed by cooling volcanic flows) that is extremely dense. It is usually polished although some countertop fabricators are offering interesting patterns (like "leather") that has more of a matte textured finish. Granite is very resistant to scratches and staining. 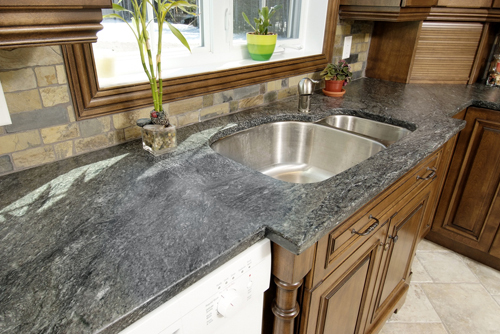 Pricing of granite has most to do with availability and commonly available granites are one of the most economical types of countertop materials, though they can also range into one of the most expensive. [caption id="" align="alignleft" width="200" caption="Here is a granite slab courtesty of Frank's Marble & Granite, LLC"] [/caption] This slab illustrates well the variations in color and pattern you can see in one slab of granite. Other granites have much tighter and more uniform patterns. Colors range from flecked white tones through black, and everything in between. Marble is a metamorphic rock that has chemically recrystallized from it's original state of limestone. It is typically polished although marble looks quite beautiful when it is just "honed" to more of a matte finish. It is softer and more porous than granite, so greater care needs to be taken to prevent stains and scratches. 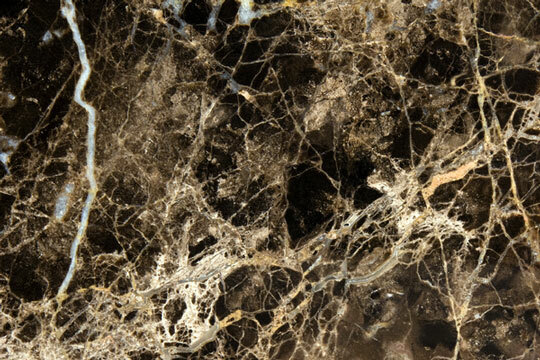 Here is a picture of black marble, a good example of the veining that is typical in marble. Limestone is a sedimentary rock composed mainly of calcite from the shells of marine organisms. Because of this limestone often contains tiny fossils which can look very cool! Limestone is often just honed rather than polished, and with it's earthy tones it is very warm and inviting for a stone surface. Although very durable, limestone tops will be the most susceptible to etching from acids. One advantage of a non-polished countertop is that minor scratches will have little to no effect on the appearance of the top. Travertine is a sub-type of limestone that is formed in streambeds. The floor and wall surround in this bathroom are two different kinds of honed limestone tile. This brings us to our final natural stone option for kitchen & bath counters. Remember those countertops from your lab stations in chemistry class? You guessed it: soapstone! Like marble, soapstone is a metamorphic rock. Typically it is darker in color and looks quite dull unless it is kept oiled. It sometimes has veining reminiscent of marble, and can be a a great option for consumers who don't mind some maintenance to achieve a durable counter with a unique look. 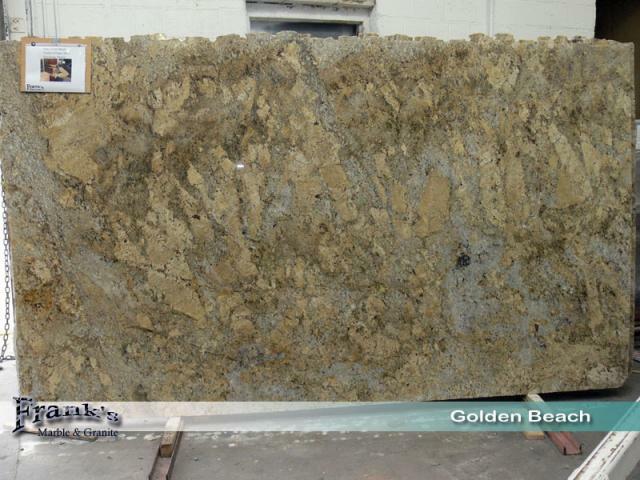 Very few customers choose soapstone when looking at slabs in the warehouse. It is dull when dried out, but as you can see here, it is very attractive when oiled. That sums up our choices in natural stone. In part II we'll discuss man made stone slabs: quartz and it's cousins. Previous post: Which Countertop Material for my Kitchen Remodeling Project?